ANC Eye Drops actas an anti allergic, astringent & decongestant. Naphazoline acts as a vasoconstrictor to narrow swollen blood vessels to reduce the redness. Hydrxtpropylmethyl cellulose acts as lubricant to give relief from dry irritated eyes. Chlorpheniramine maleate acts as antiallergic gives relief from itching, watering of eyes due to allergy. Zinc sulphate acts as an astringent that helps clear mucus from the outer surface of the eye often associated with exposure to pollen, dust and smoke. Primary packing - 10ml Opaque poly bottles White caps & Nozzles. 10ml of solution in White poly bottles with white caps & nozzles in properly sealed. Keep in a cool & dark place. Below 30ºC.Do not allow to Freeze. It is indicated for temporary relief of redness and discomfort due to minor eye irritations and relief of burning and irritations due to dryness of the eye. Instill one or two drops in the affected eye(s) 3 times a day. It is contraindicated in patients with known history of hypersensitivity to the ingredients used in this formulation. To avoid contamination do not touch tip of container to any surface. Replace cap after using. If you experience eye pain, changes in vision, continued redness or irritation of the eye, or if the conditions worsens or persists for more than 72 hours, discontinue use and consult a doctor. Keep this and all drugs out of reach of children. 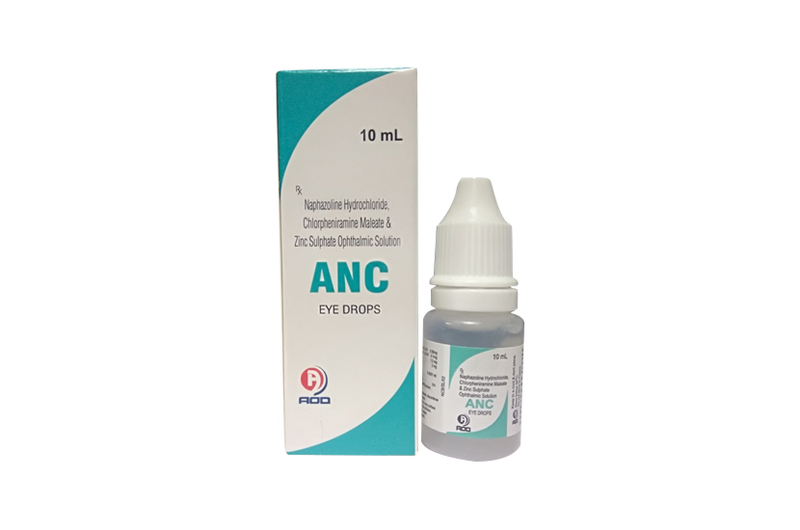 ANC Eye Drops is supplied in 10ml clear poly bottles packed with printed labeled in a unit carton and, Such 25 Carton packed in a shrink sleeves.such,12 shrinks packed in a shipper.